The lab is secured during all hours. Please make arrangements with a lab representative to gain access to the building. The lab is located in the North Avenue Research Area, approximately 1/4 mile southwest of the Georgia Tech main campus. Drive North-East on 85/75 and take exit 249D toward W Peachtree St/US-19/US-29. Turn right onto Linden Ave. Turn left at the next block to West Peachtree St NW. Take the 2nd left onto North Avenue. The lab is about a mile West on North Avenue. Shortly after passing under a series of bridges, the lab facility will be located on the right (North) side of the road. Drive South on 85/75 and take exit 249D to US-78/North Ave/US-278. Merge onto Williams Street NW, and make the first right onto North Avenue. The lab is about a mile West on North Avenue. Shortly after passing under a series of bridges, the lab facility will be located on the right side of the road. Driving directions can also be obtained from Google Maps here. The most accessible MARTA transit station is the North Avenue (N3) station. If coming from the airport, any Northbound train will stop at this station. You may either walk 1 mile west on North Avenue from the MARTA stop to arrive at the lab, or take the generally available taxi service from the station. If contacted ahead, lab personnel may also be able to pick you up at the MARTA stop. Take the Stinger Green Line from any of the stops on campus towards North Avenue Research Area (NARA) stop. The Green Line's route and live tracking of the buses can be found at Next Bus. The bus stops approximately fifty feet from the front gate. Parking is available for visitors near the lab building within the North Avenue Research Area complex. The parking attendant will direct you to a parking spot. The Sustainable Thermal Systems Laboratory entrance is located on the east side of the stucco colored building. The lab area can be seen here. The building may only be accessed by authorized personnel. Upon arrival at the building, please call the lab phone number (404) 385-6134, or the contact person for your visit, and you will be escorted into the building. 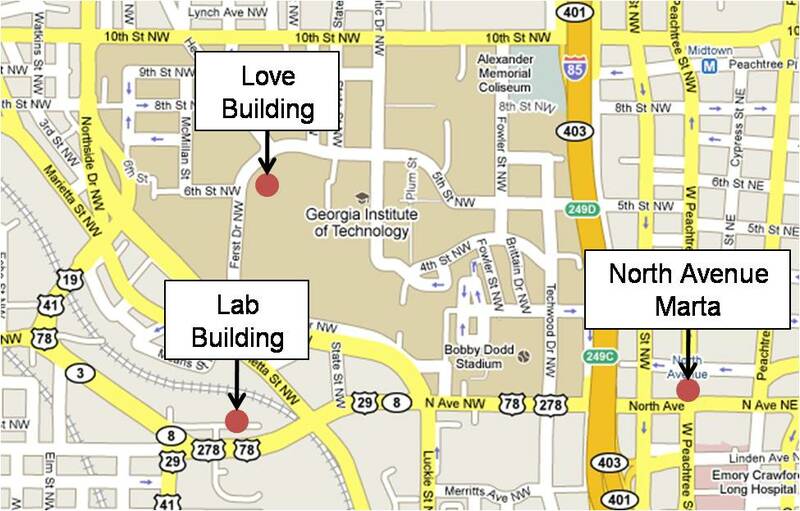 The following are hotels in the vicinity of the laboratory and the Georgia Tech main campus. This list of hotels is provided for informational purposes only; the hotels listed are not endorsed by the STSL or Georgia Tech.